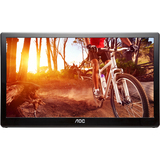 The AOC E1659FWU 15.6" LED Monitor is the perfect USB powered portable monitor accessory for laptop and computer. The widescreen monitor receives both power and signal via a single USB cable for Plug-and-Play connection; it does not require a power cord or VGA cable, and comes with a removable base for maximum flexibility. Dimensions 9.21" x 14.8" x 0.9"